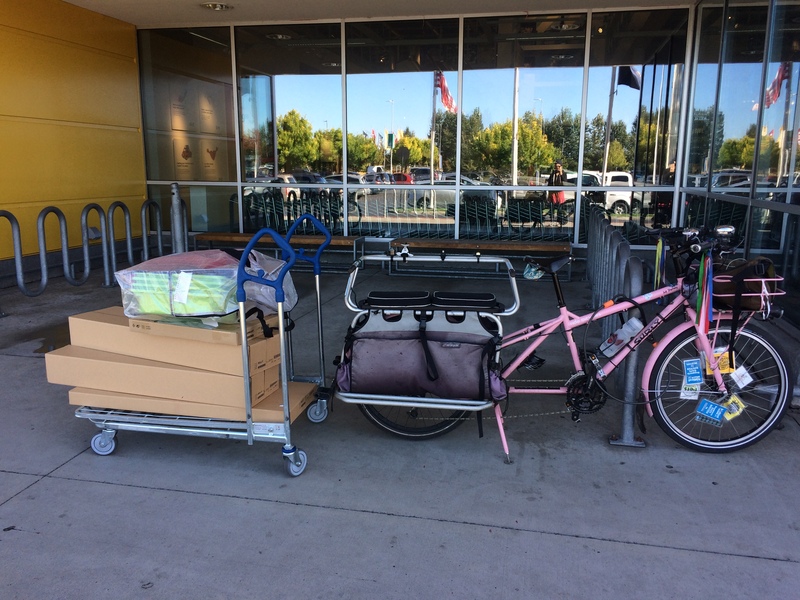 Last month I biked to an IKEA for the first time! It was also my first big trip on Portland’s I-205 Multi-Use Path (I’d tagged along with Kath when she did a test run for a Kidical Mass to the Belmont Goats). 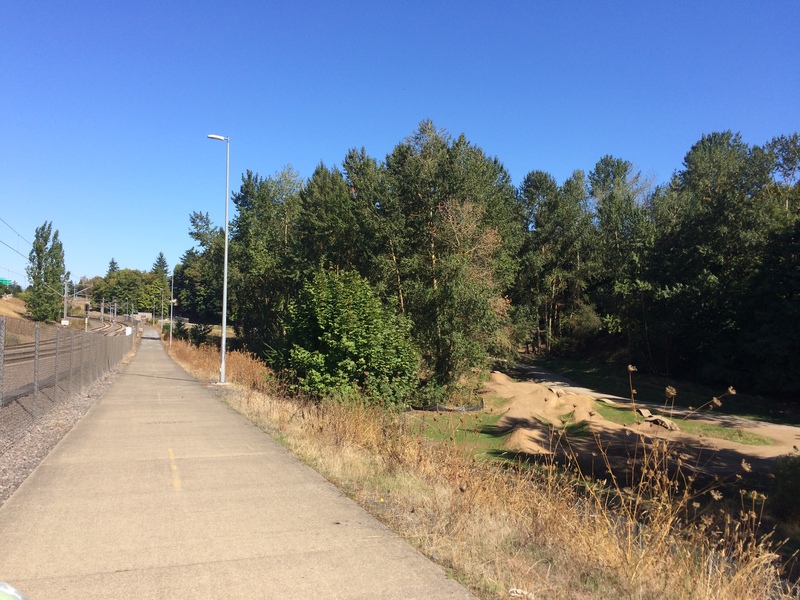 Bike Portland has a great write-up of the I-205 Multi-Use Path here: Ride takes closer look at I-205 path, the ‘Grandaddy of MUPs’. I adore multi-use paths. They tend to be flat and they have few intersections. Since they’re “multi-use” they shouldn’t be considered bike highways, but as I’m not a high-speed rider, navigating slowly and politely around dogs and walkers is fine by me. When we lived in Seattle we were a couple blocks from the Burke-Gilman Trail and I knew fast bike riders who avoided it because they thought it moved to slowly as well as parents who avoided it because they thought there were too many fast bike riders on it for it to be safe for their kids. I’d imagine the I-205 MUP receives similar criticism. It also has quite a bit of broken glass which is something we never had to deal with on the Seattle MUPs. 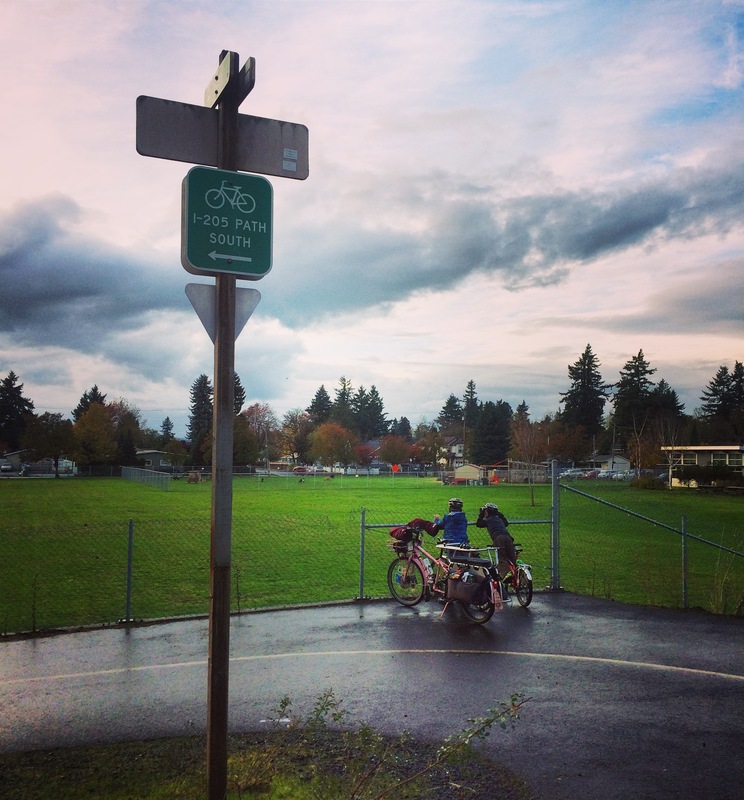 The I-205 Multi-Use Path is one-and-a-half quiet and flat miles from our house. IKEA is then 7.5 miles along the MUP followed by half a mile of flat roads. Much of the path is elevated as it crosses over big streets and parallels the TriMet MAX light rail green line. This loftiness gave me a great view of businesses below, like a bowling alley and Chuck E. Cheese. However, both of those are relatively close to our house so I don’t know that the I-205 MUP is the best way to get there–it might be more direct to cut diagonally through the neighborhoods from our house. However, it’s a way to reach them–a way I made use of recently from Montavilla. After navigating our way through two little construction road closures on our way to see Despicable Me 3 at the Academy Theater (the sewer pipe repairs are everywhere it seems! ), I elected to go a tad out of the way and use the path to get home, figuring it’d be simpler. And we got to see the goats on the way home. Also along the path is Gateway Green mountain bike skills park. This would be a fun destination with the kids, though we’d probably plan to take the MAX part of the way home after tiring ourselves out. 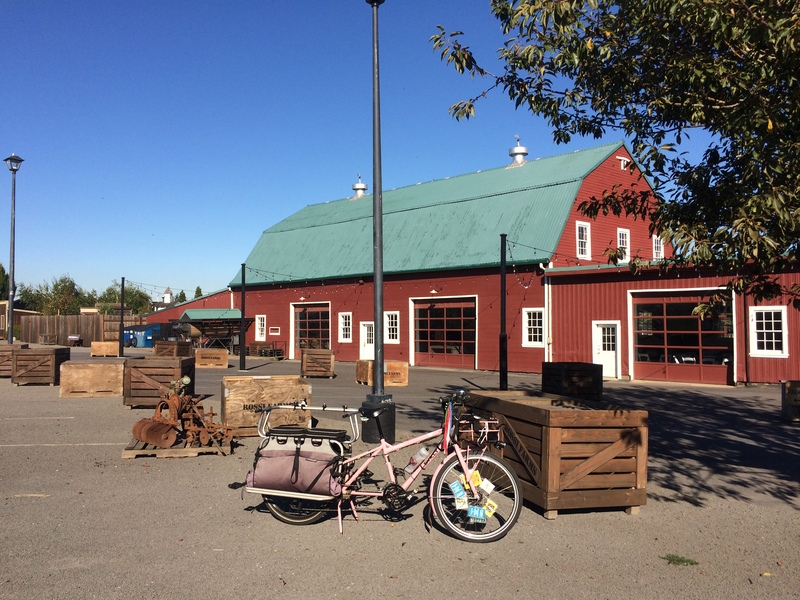 And sort of along the way to IKEA is Rossi Farms. I was still investigating local Halloween pumpkin patches during this IKEA trip so I detoured off the path to check out the farm. 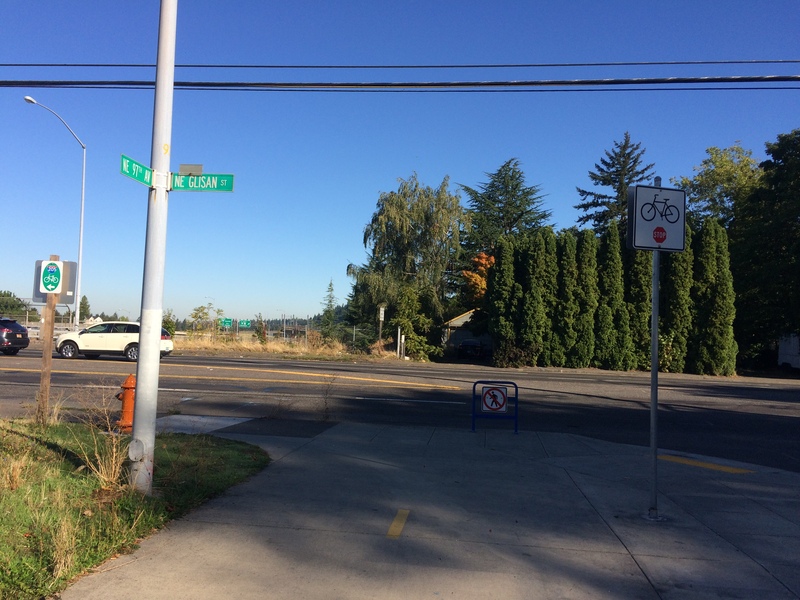 I didn’t like the route google suggested–the staggered crossing of NE 102nd Ave was so bad that I wouldn’t want to take the kids before doing another test run. Perhaps passing by the elementary school would work better. The farm is gorgeous, though, with a lovely view of Mount Hood. I tend to do all my test runs in the morning when the sun is behind the mountain, though, so it’s impossible to take a good photo to show it off. As mentioned in the Bike Portland article, the path has some busy street crossings. At Burnside one has to bike over the freeway as the trail moves from the west side of I-205 to the east. Google street view is showing me a paint-buffered bike lane on Burnside, but I don’t remember noticing it and stuck to the sidewalk. It’s a pretty fast street, even with it road dieted down to one lane in each direction and the buffered bike lane. Then at Glisan a misleading sign sent me over the freeway again…but this time the path stuck to the east side. The IKEA part of the trip was terrific. There are a ton of bike racks out front, though I was the only bike there this day. 2 small Billy bookcases, 1 tiny Billy, 1 tiny drawer unit, 1 Dimpa bag (fits a Brompton!) with a bunch of little stuff inside it. 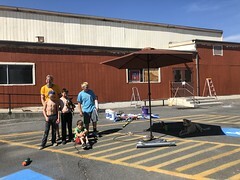 My haul was about 125 pounds, which is less than the kids weigh, and decidedly less wiggly. I was dismayed to see that the wind had picked up as soon as I left the store, though. I think this IKEA is just in a windy location, though, and path was a pleasant, wind-free ride. Here’s my Strava recording of the trip which is useful for seeing the small elevation changes. I hear one can bike to Minneapolis Ikea, as well. 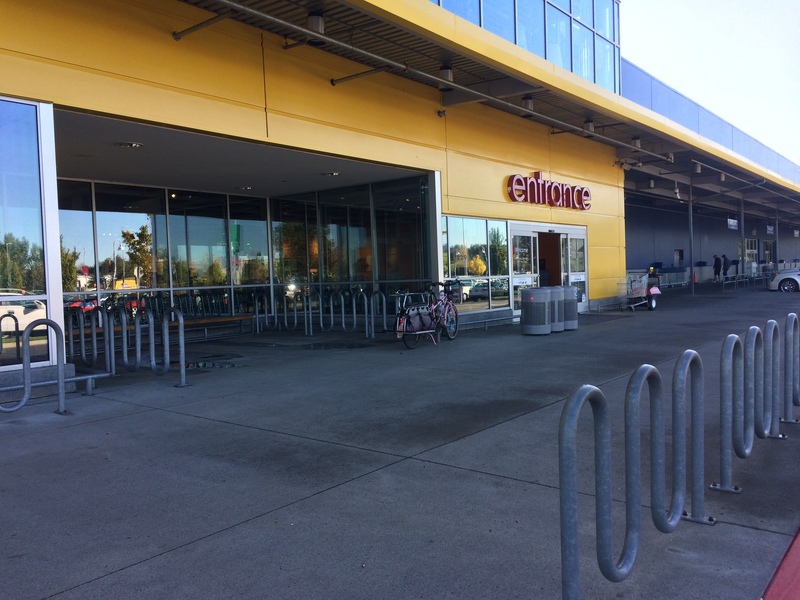 Do you know of other bikeable IKEAs? Lemme know in the comments below! 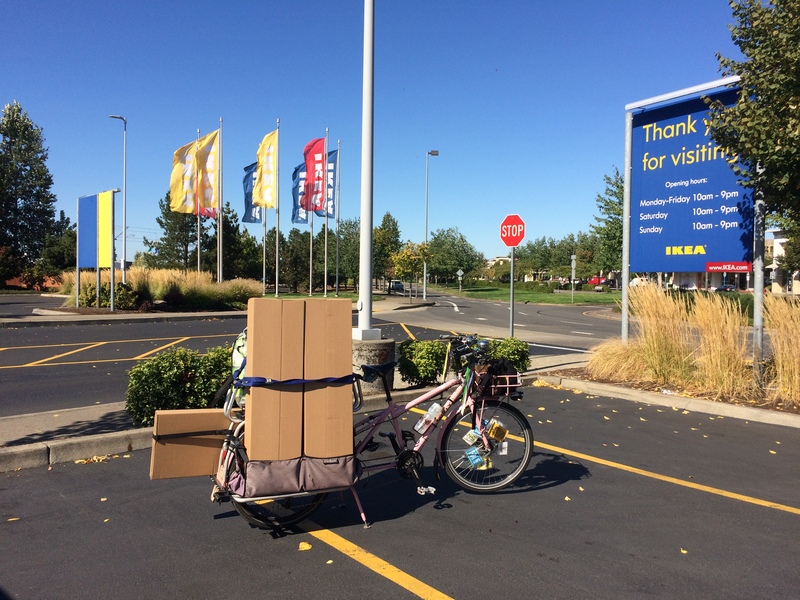 I usually take MAX to this Ikea since it’s a long ride and I’m lazy, but it’s nice to know it’s a reasonable bike ride! Ya, stuff conveniently boxed to load up via bike! I am guessing that the IKEA marketers would fall in love with you and your load :) The 205 multi-use path was such a blessing to me as I bike commutted from downtown to Kaiser Sunnyside Hospital for my cancer treatments. I took the Springwater to the 205 path, that was of course heading south while you were heading north here. It was therapeutic to get that peaceful time on my bike. The bridge over I-5, just beyond IKEA is the start off to one of my favorite bike camping locations, Battleground state park. The route is less enjoyable than Stub Steward but camping next to a lake makes it worth it in my book. That bridge is hilariously awful to ride on though, it was like a wind tunnel and the traffic noise, ugh. But all is well that ends at a peaceful lake :)! I love your blog. And I absolutely love that you hauled home some Billy bookcases on your bike 7 miles. As for other IKEAs you can bike to, my son and I were biking around Philadelphia using their most awesome bike share program and found ourselves by accident at an IKEA. That was a pretty nice surprise. You have to take some sidewalks to get there, but surprisingly Philadelphia is a very easy to get around by bicycle. It’s really fun biking down cobblestone streets where so many important historic events took place. Keep up the great blog. I really enjoy reading it.